There is already a lot of info on how these work, so I won't get into that. 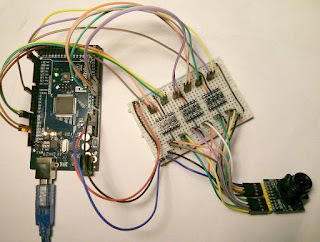 - Arduino Mega or compatible development board. In this tutorial I use a Mega2560 clone. - Jumper wires and breadboard to make the connections. Some people have added pullup resistors to the SDA and SCL lines and disabled the internal pullups. However, in this setup things worked straight away without these steps. Hi, thank you so much, as it is a long time I am searching for something serious on the subject. I have try to setup baudrate as 19200, 38400 and 115200 and 5000000..
How can I receive the fresh image like you ?? Hmmm... maybe something with the wiring? I guess you are using the voltage level tranlators like indicated, right? Some other guy had problems with his sensor, have you some other ov7670 module to test? For the dark image you probably need to play with the sensor settings. Look for other registers configurations in the internet or have a look at the sensor datasheet. Look for info about the HC-05 serial BT module. You will have to increase the module's baudrate via AT commands. It should work straight away with your current setup. On the android side you can try to use the processing sketch with the APDE app. Can I re-define the pin config (from your define pin library) pin_config.h to change the function of any pin-config ? _Haven't any pin which must be standand & can not change to another pin (like SCL SDA on ArduinoMega)? Thank you for your post. 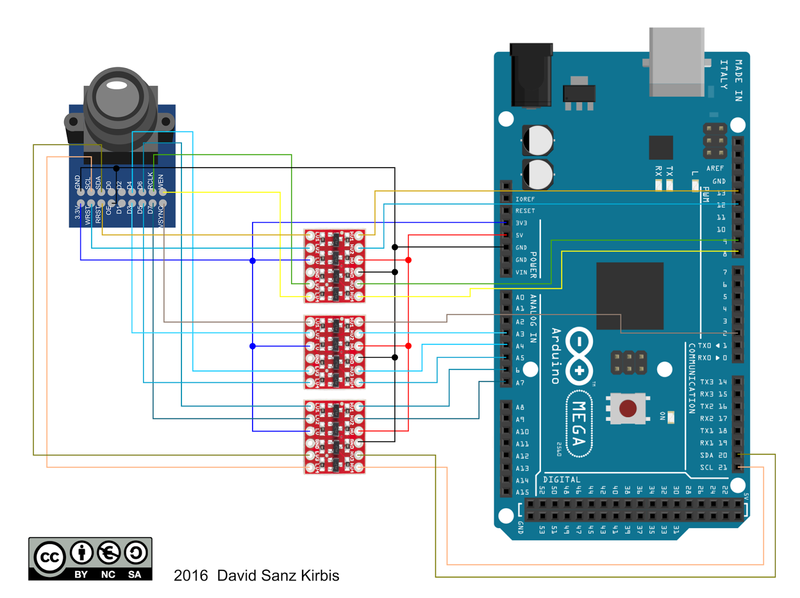 Only a question, it is posible to do it with an arduino UNO clone? Or is mandatory the use of arduino Mega? 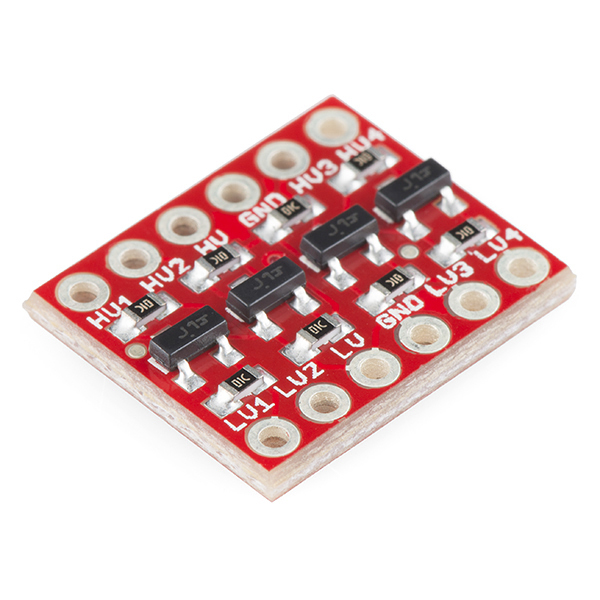 I will try using Arduino Pro Mini (3.3V) so the final result could be smaller and more compact. How do you use Arduino UNO with this code? What do I change? PANIC! sensor init keeps failing! Are you using a 8MHz (3.3v) arduino? there are ways to detect whether ov7670-fifo can operate ? "C:\Program Files (x86)\Arduino\hardware\tools\avr/bin/avr-g++" -c -g -Os -w -std=gnu++11 -fpermissive -fno-exceptions -ffunction-sections -fdata-sections -fno-threadsafe-statics -MMD -flto -mmcu=atmega328p -DF_CPU=16000000L -DARDUINO=10611 -DARDUINO_AVR_UNO -DARDUINO_ARCH_AVR "-IC:\Program Files (x86)\Arduino\hardware\arduino\avr\cores\arduino" "-IC:\Program Files (x86)\Arduino\hardware\arduino\avr\variants\standard" "-IC:\Program Files (x86)\Arduino\hardware\arduino\avr\libraries\Wire\src" "C:\Users\Little\AppData\Local\Temp\build4b980085cde7535f83d731951fbb0ae6.tmp\sketch\ov_fifo_test.ino.cpp" -o "C:\Users\Little\AppData\Local\Temp\build4b980085cde7535f83d731951fbb0ae6.tmp\sketch\ov_fifo_test.ino.cpp.o"
Any idea of what is happening? Thank you! Can you please try removing the "static" from the function declaration? Hello David! I thought I had done removing "static" before, but now, I tried it again and it worked (maybe I had removed "__inline__" also! Thank you very much! Would you explain the reason why I had to remove "static" and why it's compiling now? Glad it works now! I'll change the github sources. It might have to do with changes in different versions of the Arduino core libraries. Hi, I have the newer version with inverted VSYNS. How can I get this code to work with it. I have read that you have to put one into COM10 register. But i can not seem two find out how I do it in your code. how to use that receive_stream_mega.pde? Can you help me saving image file in sdcard? i interfaced sdcard.But how to save image. Good to hear the streaming worked. At the moment I'm quite busy so I wont be able to help you with the SD card stuff. why didn't you used d0,d1,d2? To reduce the amount of data to be transferred in the streaming. Mega is capable of taking a picture. I would use this camera to view the picture on a 7" LCD screen, for example! Or via Wi-Fi Module! 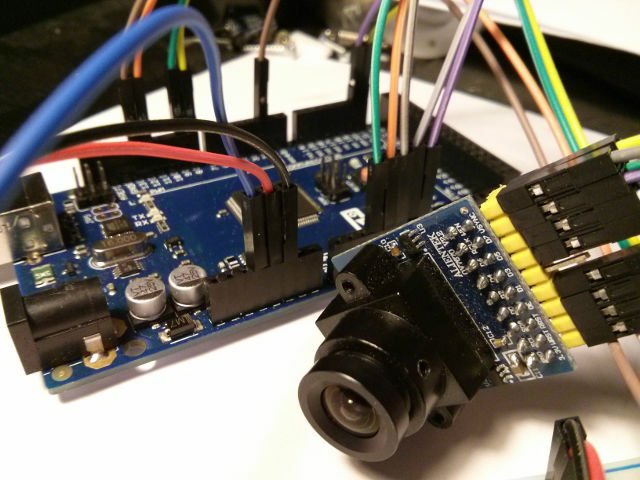 How to get raw image data without processing software.may be on arduino serial monitor. hi there. I`d like to know what should be the name of the serial port to match with my system? hi, what OS are you using? OSX, Windows, Linux? I don't know how to match my port name in my computer with the processing code. what should I chane it to? what OS are you using? OSX, Windows, Linux? It seems your ov7670 module doesn't have FIFO, it will not work with my code. I really need help. I dont know how to open receive_stream_mega tab in the video.